Check out the way Warren & Derek are looking at him. Nice pic, thanks. How should I know this dude? Just listened to a few of his tunes from his website. I hate the way he sings Wind Cries Mary. ... was he good or bad or.. ? By the looks on Derek and Warren's faces I'm guessing no? I heard that he was awesome. He sounded pretty good when I listened to the show. Not only did he keep pace with Derek and Warren, he had the most awesome game face which you can kind of see from the picture. He was fun to watch. It was interesting to watch Derek through the four guests that night. 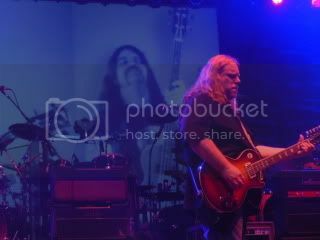 during Vince's playing, Derek was deadpan as the picture above. He started smiling during Dave Mason. When Luther Dickinson and Leslie West were on stage, he was smiing ear to ear. I thought Vince was good, but was a bit too much of a showboater. Certainly not in the same league as the other guests- Luther and Leslie killed that night. I thought Vince was incredible, but I have not had an opportunity to hear the show again. I would absolutely recommend you see him when he is on the mainland. I really tried to go on one of the post-easter shows that he played in NYC, but could not get it done. As for Mason, I thought he was excellant, loved the choice of songs, and he played a really nice looking (and sounding) guitar. Anybody know what kind it is? West was as good as I have ever seen him, but Luther was a little disappointing. I guess I expected the most out of him, so he needed to really step up. Still cannot wait to see them at MJ in June. Macon--i'll look for Vince if he comes around--always willing to try a second listen--having to stand near WARREN & DEREK can't be easy!!! I agree with you, and I think Derek's deadpan expression throughout the time Vince was on stage was ab indication that he felt the same way. i was at this show, and he was INCREDIBLE!!!!!!! !